If you are losing your hair, don’t despair. Amy Meshkati offers both surgical and non-surgical solutions to restore a full head of healthy, natural hair, regardless of the cause or extent of hair loss – and the results are (swish, swish) beautiful. A curtain of long, shiny hair. A glossy mane of tumbling locks. From Cleopatra to Botticelli’s goddesses, Bond girls to the Duchess of Cambridge, romantic heroines throughout cultural history are admired for their voluminous tresses. Male leading figures, too, are archetypically distinguished by a head of lustrous hair. But hair has far more importance than superficial beauty or physical attractiveness. Those 100,000 or so strands on our heads – so individual in terms of colour, texture, style, sleekness or curliness – carry a complex emotional significance bound up in our sense of identity and self-assurance. Our relationship with our hair goes far beyond the way a ‘bad hair day’ or an overzealous cut at the salon can affect our mood. Our hair can be a barometer of emotional well-being, a signal of attitude – from a defiant breakup makeover or a no-nonsense ‘power bob’ to a swooshy party-time blow dry or dip-dyed festival hair. Not everyone, however, is blessed with hair they want to draw attention to. Hair tends to thin as we get older, and hair loss caused by stress, genetic factors, chemotherapy, thyroid or skin disease, and overprocessing (extensions or harsh dyes) can be dramatic – with a parallel loss of morale. For men, hair has historically symbolised strength and virility (remember how Samson lost his prodigious power when Delilah ordered his locks to be snipped). To lose 50 to 100 hairs per day is normal, part of the renewal process, but excessive loss due to hereditary male pattern baldness is common, and the dismay of looking in the mirror and monitoring a receding hairline or increasing bald patch can be a nagging cause of distress. So, what to do when your hair becomes a source of grief, when you feel the need to seek a revitalised head of hair to get your ‘look’ and self-confidence back? People in the know will tell you to consult Amy Meshkati. For more than 30 years, Meshkati – a French biologist and pioneer in undetectable hair restoration procedures – has been a saviour in treating hair loss and helping individuals maintain a full head of hair. 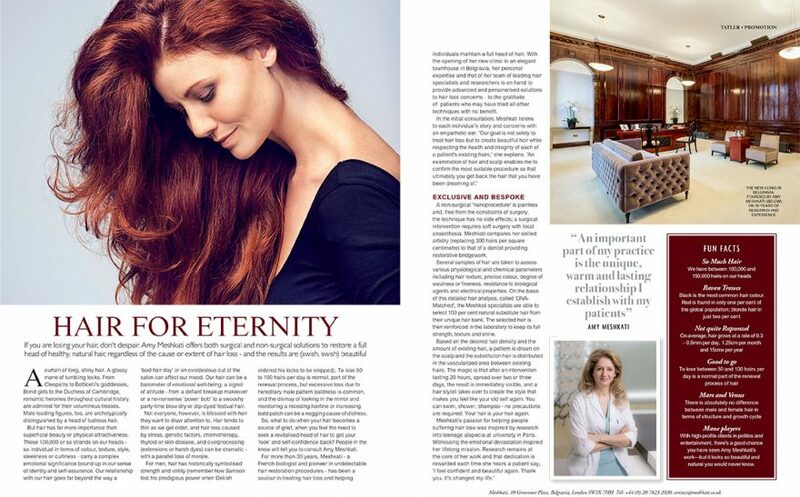 With the opening of her new clinic in an elegant townhouse in Belgravia, her personal expertise and that of her team of leading hair specialists and researchers is on hand to provide advanced and personalised solutions to hair loss concerns – to the gratitude of patients who may have tried all other techniques with no benefit. A non-surgical ‘nanoprocedure’ is painless and, free from the constraints of surgery, the technique has no side effects; a surgical intervention requires soft surgery with local anaesthesia. Meshkati compares her skilled artistry (replacing 300 hairs per square centimetre) to that of a dentist providing restorative bridgework. Several samples of hair are taken to assess various physiological and chemical parameters including hair texture, precise colour, degree of waviness or fineness, resistance to biological agents and electrical properties. On the basis of this detailed hair analysis, called ‘DNAMatched’, the Meshkati specialists are able to select 100 per cent natural substitute hair from their unique hair bank. The selected hair is then reinforced in the laboratory to keep its full strength, texture and shine. Based on the desired hair density and the amount of existing hair, a pattern is drawn on the scalp and the substitution hair is distributed in the vascularized area between existing hairs. The magic is that after an intervention lasting 20 hours, spread over two or three days, the result is immediately visible, and a hair stylist takes over to create the style that makes you feel like your old self again. You can swim, shower, shampoo – no precautions are required. Your hair is your hair again.